IRA man Séamus Murphy, who has died aged 80, was the only man to succeed in escaping from Wakefield prison in west Yorkshire on February 12th, 1959, when republicans staged a daring rescue attempt. “There were five men that had been earmarked for the escape. 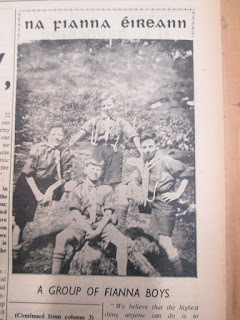 Two of them were Eoka men [George Skotinos and Nicos Sampson], another two were IRA, myself and Joe Doyle, while there was also a fifth with us, Tony Martin, who had deserted the British army in Cyprus and fought on the side of Eoka before he was arrested,” Séamus Murphy said afterwards. Murphy had been serving a life sentence for an IRA raid on an arms depot at Arborfield in Berkshire in 1955. The raid, which was part of Operation Harvest, intended to obtain arms to use against the British army in Northern Ireland, had succeeded, and the main party, including Ruairí Ó Brádaigh, escaped. Séamus Murphy had stayed behind to tidy up loose ends and he and Joe Doyle and Donal Murphy were arrested, charged and given life sentences. Already in Wakefield prison then was Cathal Goulding, IRA chief of staff, along with a future chief of staff, Seán Mac Stiofáin. The Irish quickly made common cause with Greek Cypriot Eoka members, the two groups seeing in each other fellow freedom fighters. In prison Murphy played chess with Klaus Fuchs, a German scientist jailed for giving atomic secrets to the Russians, while his fellow IRA prisoner Marcus Canning learned Greek from the Cypriots. Another Cypriot prisoner, George Ioannau, translated the writings of James Connolly into Greek. The IRA had failed in an earlier attempt to get Goulding out, and the Séamus Murphy escape was the work of a splinter group associated with maverick republican Joe Christle, working with Eoka sympathisers living in London. Outside the prison, republicans Aine and Séamus Grealey acted as decoys by pretending to be a courting couple, while Hughie Farrell and Pat Farrelly threw a rope over the prison wall. In the event only Séamus Murphy made it to freedom. The operation, which involved the rent of flats and the hire of two cars, was paid for by a Cypriot woman, Katerina Pilina, with her £500 wedding dowry. Murphy hid in a flat in Manchester for three weeks, while a Sunday Press “interview” in Dublin proclaimed his return to Ireland. He eventually made his way home via Glasgow. Séamus Murphy, Jim to his parents and younger sisters, was a native of Castledermot, Co Kildare, where his mother was the postmistress. His father, a baker, died young. While boarding at Terenure College, Dublin, he joined the IRA. On his return to Ireland, he had difficulty finding work, eventually working on a baker’s delivery round. He met a young woman, Betty O’Donoghue, also from his home county of Kildare, and they married in 1963. They settled in Bray, Co Wicklow with their son, and Séamus Murphy worked in the nearby Solus light bulb factory. 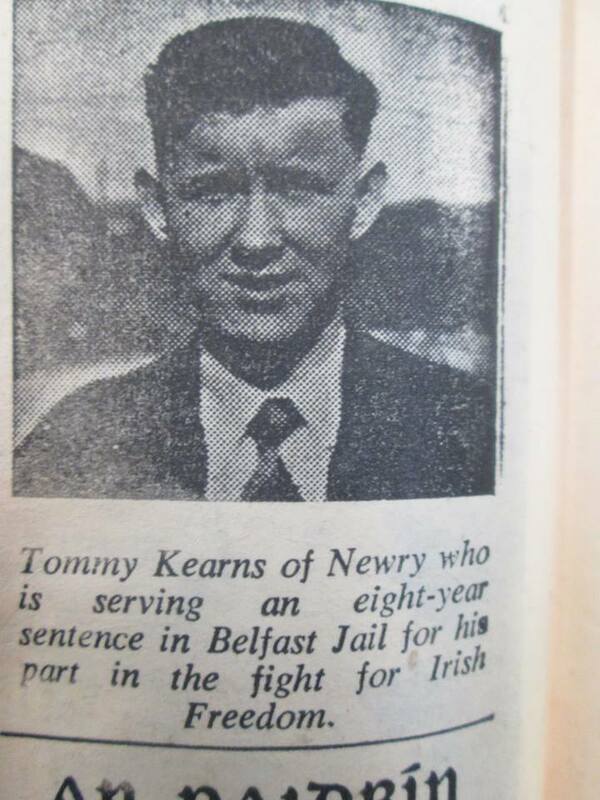 His days of active service were over, but he remained a member of the republican family, did not embrace Goulding’s move to socialism and opposed the Belfast Agreement. When Vivas Lividas launched the Greek language edition of his book Cypriot and Irish Prisoners in British jails 1956-59 in 2007, Séamus Murphy visited Cyprus and met many old friends from prison days, including Nicos Sampson, by then a highly controversial, some would say suspect, figure. There he also got to thank in person Katerina Pilina, who had donated her dowry to get him out of jail. He is survived by Betty, his son, Pearse, and his sisters, Carrie and Chris. I first met Seamus at a reunion of Border Campaign veterans in 2005. At the time Scott Millar and I were working on the Lost Revolution and Semaus immediately agreed to help in any way he could. Seamus did not support the Officials after the split but he remained on good terms with people on all sides of the various fractures in republicanism. When I interviewed him at his home in Bray he gave me access to his vast collection of photographs and permission to use them as I saw fit. He also gave me a DVD of home movie footage he had shot during the 1960s. It included footage of the pre-split Bodenstown commemoration in 1969, the Official republican Bodenstown in 1970 and various protests in Dublin and Wicklow. Some of the footage has since found its way onto the internet, much to my embarrassment as Seamus never gave me permission to allow that. However when I rang him to apologise he was his usual goodhearted and generous self. He was a gentleman. My condolences to Betty and his family. 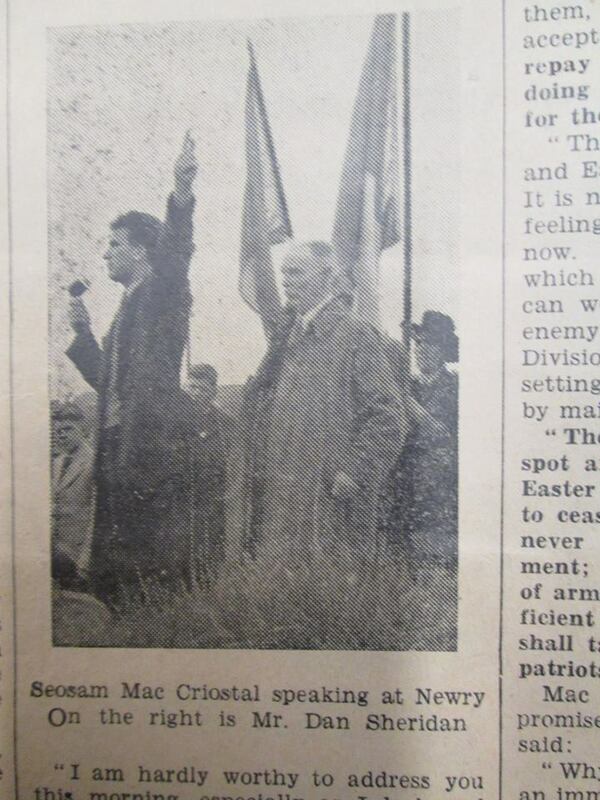 Seamus remained a committed Republican over the succeeding decades. Seamus Murphy was a man of erudition and intellect as well as action. Seamus was a very private man who did not boast of his exploits yet in private was generous, both with his time and his extensive knowledge of Irish and international revolutionary history. Time spent in the company of Seamus Murphy was always a rewarding experience. In 2008 Seamus honoured me with an invitation to join him and other IRA and EOKA veterans for a private dinner which was a marvellous night of stories and great comradeship, one truly felt in the presence of living history and privileged to be there. To his wife Betty, his son Pearse and the rest of his family I wish to express my deepest sympathy. His like will never be seen again. Ar dheis Dé go raibh a anam dílis. Seamus Murphy was a great friend and supporter of International Brigaders, and attended many commemorations in both Ireland and Spain. My brigadista father Micheal O'Riordan was on a visit to Seamus and Betty Murphy in January 1996 when the news came through that the Spanish Parliament had voted to give the right to claim Spanish citizenship to all surviving brigadistas, and it was in the Murphy home that he was filmed for RTE News welcoming that vindication. Sincere condolences from all the O'Riordan family to Betty and family. Seamus died on 2 November 2015 and his many friends assembled in the Victorian Chapel of Mount Jerome Cemetery to celebrate his life. Fr. Piaras Ó Dúill recited prayers in Irish and Sean O’Mahony, author, acted as master of ceremonies. Manus O’Riordan sang in Spanish in tribute to Seamus’s deep interest in the Spanish Civil War and his participation in commemorating it over many years. He also sang ‘The Galtee Mountain Boy’, while Johnny Morrissey and daughter performed traditional music. Anna Barron read “The Wayfarer” by Patrick Pearse. Operatic arias and “die Internationale” (in Russian) sounded among the Victorian monuments to the British establishment in tribute to Seamus’s other interests. Rifles, 2; Bren Light Machine Guns, 10; Sten Carbines, 55; Sten Magazines, 359; and Pistols .38, 1. Ammunition—52,315 rounds .303; 30,899 rounds 9 mm. ; 1,332 rounds .38; and 1,300 rounds .22. A zealous policeman spotted one of the loaded vehicles returning to London, investigated and arrested its passengers, leading to the seizure of their cache and the arrest of Seamus, Joe Doyle of Bray and Donal Murphy. 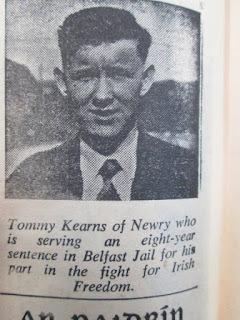 They were sentenced to life and Seamus found himself in Wakefield Prison, a grim institution, schooling Irish prisoners in the Fenian tradition. There he mingled with Klaus Fuchs, the German-born Atomic spy, and Greek Cypriot EOKA prisoners, in whom he found life-long friends. Escape was plotted, part-funded by a Cypriot lady, who donated her dowry. Pat Donovan transformed himself into a troublesome criminal to enter Wakefield to assist from the inside. When the jail break came off, Nicos Samson and Joe Doyle were left behind, while the cautious Fuchs declined. Only Seamus crossed the wall and was spirited away to Manchester. In Castledermot, his Mother pretended that he had arrived safely to mislead the authorities and he finally flew home on Aer Lingus to a hero’s welcome. Seamus and his wife Betty made a great team with a warm welcome to their home in Bray. Their Cypriot friendships of fifty years culminated in the publication of a book by Vias Livadas in Greek and English about Cypriot and Irish Political Prisoners held in British prisons 1956-1959. Cypriot messages of condolence were read aloud in Mount Jerome. Seamus was invariably reading or discussing political theory with friends, but he was also devoted to his son Pearse and three beloved grandchildren. Fíor Ghael, a fhulaingt a ualach gan gearán. Chun tosaigh ag déanamh an íobairt. Mhothaigh sé comhbhrón le gach muintir, pé áit sa dhomhain, a bhí faoi chos an tíoránach. Sheas sé, i gcónaí, leo siúd a bhí faoi míbhuntáiste. Beidh an saol níos measa ina easpa. Ní bheidh a leithéid linn arís.